Beautiful estate spanning two full port royal lots with sought after western exposure with environmental views across old harbour channel. Gracious entrance from fort charles drive with a classic reception area. Perfect location for a boater with close proximity to gordon pass and convenient to the port royal clubs beachfront, fine dining, tennis, and fitness center. This unique home features seven bedrooms total including a separate guest house consisting of two bedrooms and living room overlooking the expansive pool deck. Separate pool cabana with a pool bath and grill area. The first floor includes rooms constructed with great attention to detail. Rooms include: study, living room, dining room, game room, theater, staff quarters, private guest suite, work shop, and two separate two-car-garages. The kitchen is open to the family room and the breakfast room. The second floor includes a large master bedroom with sitting room and multiple terraces, two guest suites and a large gym with a full bathroom. There is a separate staff quarters over the garage including a family room and kitchen. Port royal club membership eligibility. With over 276' of water frontage, and ideal access to gordon pass and the gulf, this port royal estate is truly the definition of florida paradise. Behind the gates, up the circular drive and through the courtyard with beautiful fountain, an exquisite home awaits. This enchanting home of bermuda architecture by highly regarded jeff harrell of harrell & co architects, includes 5 bedrooms with 6 full baths plus 2 half baths, 2 offices, theater room, chefs kitchen with top of the line appliances, butlers kitchen, wine storage and a 6 car garage. Substantial timeless detailing includes unmatched ceiling finishes and impeccable wood trim. Due to the large size of this property a 957-square foot, detached, guest house was permitted. Multiple decks and covered outdoor living areas allow you to enjoy the beautiful pool area, views of old harbour cove and a serene koi pond. This unique cul-de-sac property features two docks. One dock provides slips for 2 boats and both have lifts. The other dock is perfect for launching paddle boards, canoes or kayaks. Eligible for port royal club membership - the club is 3 blocks away. Port royal is world renowned for its elegance and fabulous estates. 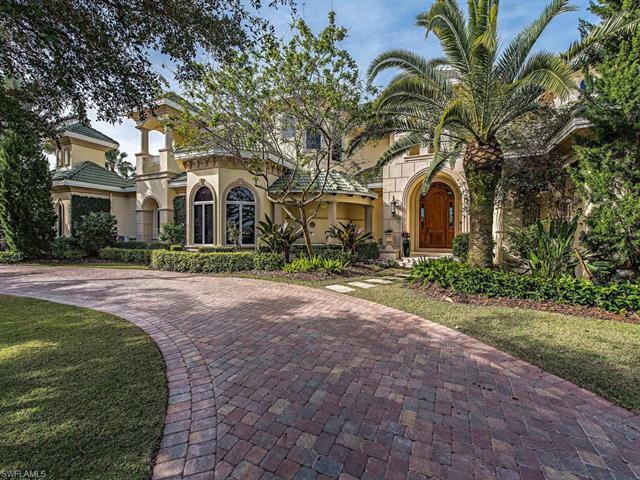 As of today, 4/24/2019 the average home price for homes for sale in Naples is $912,312.